A small green dog runs across the page — but a lift of the accordion flap stretches him out into a long, lanky pup. 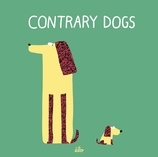 Dogs of all shapes and sizes transform into surprising new forms in this vibrant, interactive play on opposites. Lift the flaps to learn about opposites from the lovable dogs in this humorous board book. 20 / 6 5/16" x 6 5/16"
Élo is a French designer, artist, and textile creator. She lives in France.